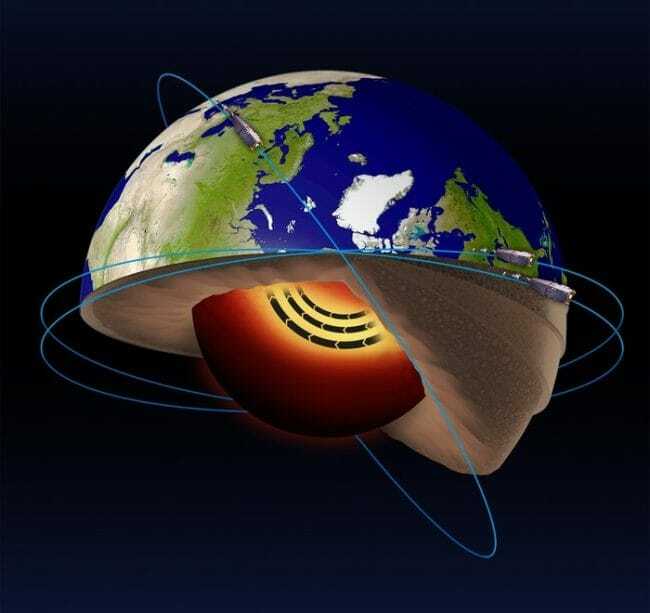 ESA’s (European Space Agency) Swarm satellites have discovered a jet stream in the liquid iron part of Earth’s core, nearly 2,000 miles (3000 km) below the surface. and the movement of the jet stream in Earth’s core, via ESA. Scientists using data from the Swarm satellite trio have discovered a jet stream deep below Earth’s surface. The European Space Agency (ESA) launched Swarm in 2013 to study Earth’s magnetic field. Peering down from space, the mission found evidence of the underground jet stream nearly 2,000 miles (3000 km) below Earth’s surface, in the liquid iron part of Earth’s core. Earthly processes seem slow on human timescales, and the internal jet stream is moving at about 25 miles (40 km) a year. But that’s three times faster than typical speeds in Earth’s outer core and hundreds of thousands of times faster than the movement of Earth’s tectonic plates (the slabs of solid rock that make up Earth’s outer crust; they move at about the same speed that your fingernails grow). What’s more, Earth’s internal jet stream is seen to be speeding up. It might also change direction, scientists say. The scientists who found it published their results on December 19, 2016 in the peer-reviewed journal Nature Geoscience. Earth has a magnetic field because of the superheated, swirling liquid iron that makes up our world’s outer core. The turbulent convection of this liquid iron sets up a process much like that of a spinning conductor in a bicycle dynamo. The moving iron creates electrical currents, which in turn generate our planet’s magnetic field. Earth’s magnetic field is constantly changing and shifting. Plus other sources of magnetism come from minerals in Earth’s mantle and crust, while the ionosphere, magnetosphere and oceans also play a role. Together, they form the magnetic field that protects us from cosmic radiation and charged particles that stream towards Earth in solar winds. ESA launched the trio of Swarm satellites to measure and untangle these different magnetic fields. Tracking changes in the magnetic field can tell researchers how the iron in the core moves and provide information we wouldn’t have otherwise about Earth’s interior … for example, about Earth’s internal jet stream. higher orbit at a different inclination, slightly closer to Earth’s pole. Scientists found the jet stream after noticing a pattern of magnetic flux patches in Earth’s Northern Hemisphere, mostly under Alaska and Siberia. Phil Livermore from the University of Leeds in the U.K. and lead author of the paper said in an ESA statement: "These high-latitude flux patches are like bright spots in the magnetic field and they make it easy to see changes in the field." Swarm reveals that these changes are actually what scientists are now describing as a jet stream. Livermore said its movement – three times faster than typical outer-core speeds – can be explained: "… as acceleration in a band of core fluid circling the pole, like the jet stream in the atmosphere." Scientists believe the jet flows along a boundary between two different regions in the core. When material in the liquid core moves towards this boundary from both sides, the converging liquid is squeezed out sideways, forming the jet. The Swarm team is excited about this discovery, and they say they’re “watching and waiting” to see what’s next. One possibility is that, as Earth’s magnetic field changes, the jet stream could change direction. Rune Floberghagen, ESA’s Swarm mission manager, said: "This feature is one of the first deep-Earth discoveries made possible by Swarm … it’s a very exciting time. We simply don’t know what we’ll discover next about our planet." where magnetic force is strong, at the poles, and spread out where it is weak. Image and caption via Science News/ Shutterstock/ M. Atarod. Deborah Byrd created the EarthSky radio series in 1991 and EarthSky.org in 1994. Today, she serves as Editor-in-Chief of this website. She has won a galaxy of awards from the broadcasting and science communities, including having an asteroid named 3505 Byrd in her honor. A science communicator and educator since 1976, Byrd believes in science as a force for good in the world and a vital tool for the 21st century. "Being an EarthSky editor is like hosting a big global party for cool nature-lovers," she says.